Michael Archer is a well established UK Wave sailor. Having learn to windsurf on a family holiday at he age of 14, it was several years before he would take the sport up seriously due to being a competitive sailor. On starting at Southampton university aged 21 he got a taste for the sport and has not looked back. Coming 5th overal in the UKWA wave series after doing one event of four. Michael is aiming high and is competing in the BWA pro fleet. Over the last year he has been getting into his freestyle. 'I have found the Turfdog one of the most useful tools in learning anything form basic Vulcan�s to more complex freestyle moves such as funnels bobs and double spocks. It has really allowed me to accelerate my progression in freestyle and even improved my rig handling and wave moves." A particular effort has been made to support young, up and coming windsurfers with our sponsorships, providing them with the dirt windsurfing boards to push their windsurfing to the extreme. Max is part of the new breed of Club Vassiliki instructors who are now windsurfing to an incredible level. Since Andy Chambers and Colin Dixon took out a TurfDog dirt windsurf board to the Vass centre last year, Max has been hooked on them and many fellow sailors reckon that his speedy rise through the freestyle learning curve can be largely attributed to his training on the TurfDog dirt windsurf boards. Now Max has taken a TurfDog Freestyle Pro to Vass and will be letting everybody at the centre try out the board on the grass and the decking next the beach. Adam is heavily involved in the world of student windsurfing in the UK, whilst he was president of the windsurf club at Portsmouth University he introduced Wednesday afternoon beginner sessions at South Sea, on the TurfDog dirt windsurf boards. This was instantly popular with many beginner windsurfers getting to into the sport by learning to windsurf on the TurfDog Freemoves. During this time Adam improved his own skills on the TurfDog boards and now is ripping at Freestyle, pulling off Flakas, Spock 540s, Diablos and Chachos on the TurfDog boards and on the water. 2 years on and he is currently leading the Amiture BWA Wave series and has one the Bournmouth UKWA Freestlye event. 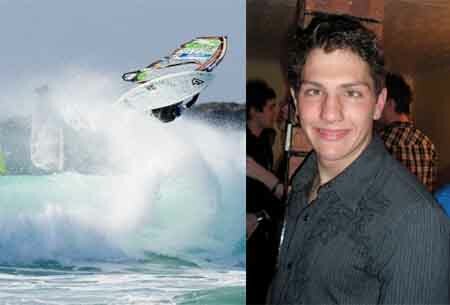 He is setting his aims high for this year, with hopes of entering the PWA freestyle tour. Eric is one of Sweden's top young windsurfers, he uses his TurfDog Freestyle Pro to teach himself the latest freestyle tricks, Eric currently competes on the Swedish Freestyle circuit. Sam is a windsurfing instructor at Rutland water, his windsurfing skills are constantly improving and despite training in the UK rather than abroad his freestyle skills are up there with the best on the freewave circuit.